Today I arrived in Siem Reap – the capital city of Siem Reap Province in northwestern Cambodia and the “gateway to the Angkor region“. When I arrived at the Phnom Penh boat house this morning to board a boat to Siem Reap, they advised that because of a broken engine they were sending passengers via air-conditioned taxis. I was disappointed and had been looking forward to the boat ride. Cloudy skies and rain the night before cleaned the air making a river trip cooler and more pleasant. 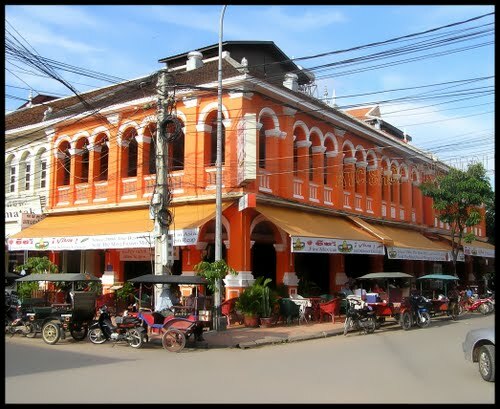 Since I had already booked accommodation in Siem Reap I agreed and got into the taxi with one other passenger – a 23-year-old student (Brad) from Palo Alto California. The drive took about 5 hours with a few stops, including a great lunch of traditional Cambodian food. It was nice to have someone to chat with and Brad was bright and interesting. Our driver didn’t speak much English. 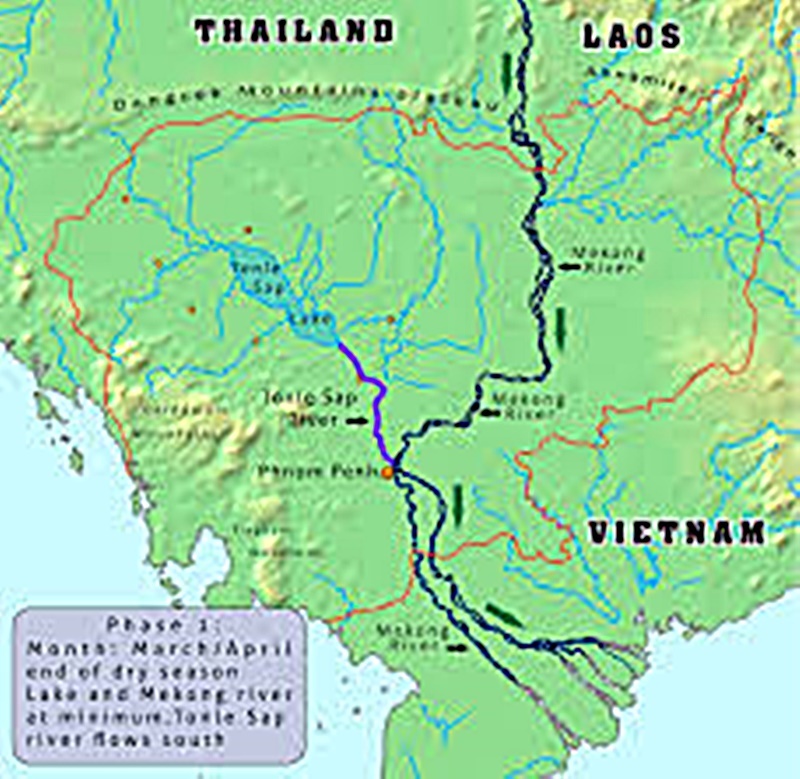 Maybe I’ll take a boat returning to Phnom Penh, so I can experience the river journey. Plan to spend a few more days in Phnom Penh before moving on to other parts of Cambodia and then Vietnam. 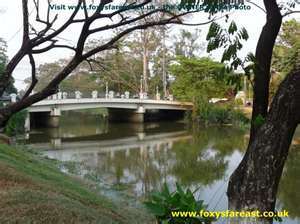 There are many interesting things to explore in Siem Reap and my friends from Oregon arrive December 10th. 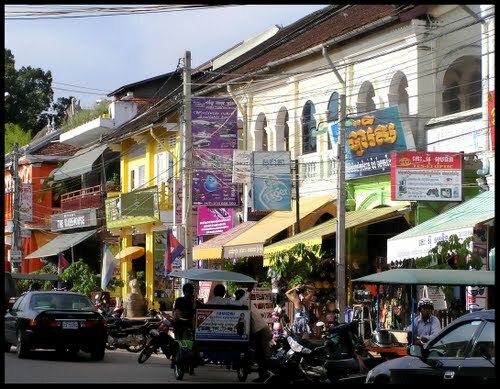 Siem Reap’s population is 85,000 and the city is full of lush gardens and colonial and Chinese/Cambodian-style architecture in the Old French Quarter and around the Old Market. In the city there are traditional Apsara dance performances, craft shops, silk farms, rice-paddy countryside, fishing villages, and a bird sanctuary near Tonle Sap Lake. Of course the main attraction at Siem Reap is Angkor Wat – the largest religious structure in the world – built by the Khmer civilization between 802 and 1432 AD. Each temple in the complex has distinct history and features. Angkor Wat includes hundreds of temples, terraces, and monuments. 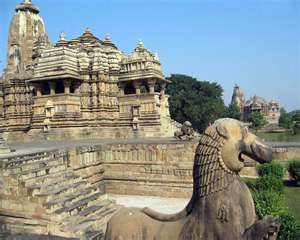 It’s best to visit early morning or late afternoon so the sun’s shadows bring out the rich stone carvings and temple walls. 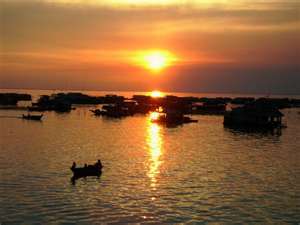 Another popular attraction is Tonle Sap Lake, Cambodia’s primary fish source. “The name Siem Reap means the ‘Flat Defeat of Siam’ – today’s Thailand – and refers to the centuries-old conflict between the Siamese and Khmer people.” Siem Reap was a village when the first French explorers re-discovered Angkor in the 19th century. When the French purchased Angkor in 1907, Siem Reap absorbed the first wave of tourists and began to grow. The violent and brutal Khmer Rouge Regime colored Siem Reap’s history and the memories of its people. 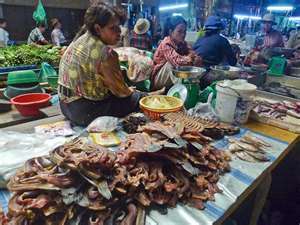 Since Pol Pot’s death in 1998, relative stability and a rejuvenated tourist industry have been important steps in Cambodia’s recovery. 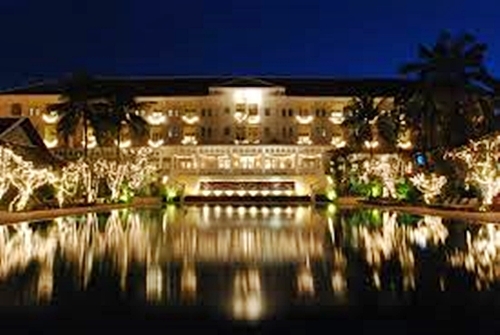 As the gateway to the Angkor temples Siem Reap is Cambodia’s fastest growing city. The cluster of small villages along the Siem Reap River was originally developed around Buddhist pagodas (Wat). 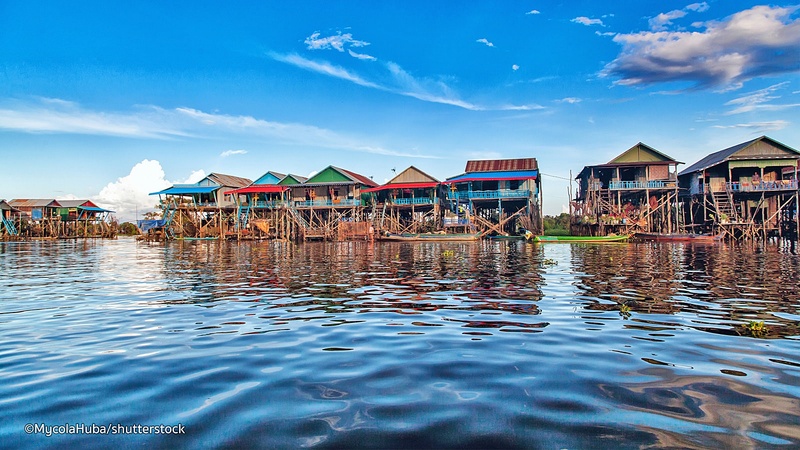 The villages are evenly spaced along the river from Wat Preah En Kau Sei in the north to Wat Phnom Krom in the south where the Siem Reap River meets Tonle Sap Lake. 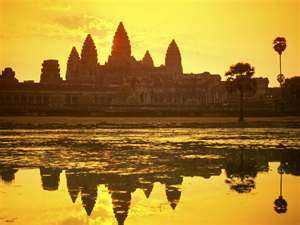 Tomorrow afternoon will be the first of many visits to the Angkor Wat temples. 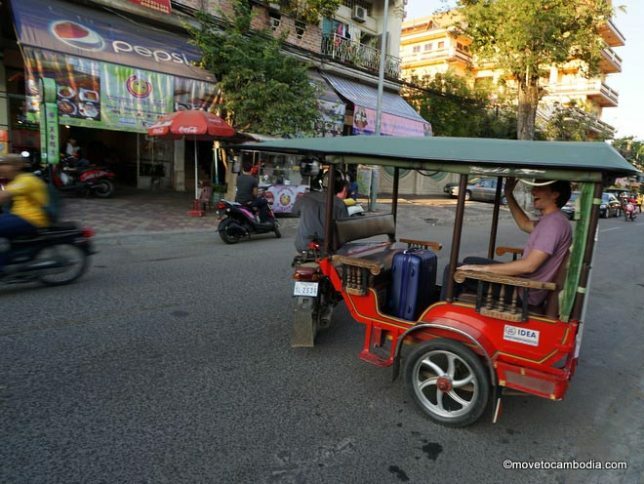 A tuk tuk driver / guide picks me up at 4:00 p.m. – it’s cooler in the evening. This entry was posted in Cambodia and tagged angkor wat, Apsara Dancers, Buddhist Pagodas, Grand Hotel d'Angkor, Khmer Civilization, Phnom Penh, pol pot, Siem Reap, Siem Reap River, Tonle Sap Lake, tuk-tuk, Wat Phnom Krom, Wat Preah En Kau Sei by suemtravels. Bookmark the permalink. Magnificent items from you, man. I have have in mind your stuff previous to and you’re simply extremely fantastic. I really like what you have bought right here, certainly like what you are stating and the way in which during which you say it. You’re making it entertaining and you still care for to keep it smart. I can’t wait to learn much more from you. That is actually a great website.